Here’s my way of saying goodbye to the white stuff and hello to the sunshine! Hopefully we are all done with the snow and sunshiney Spring days are ahead! Fave pieces are the amazing feather glasses! 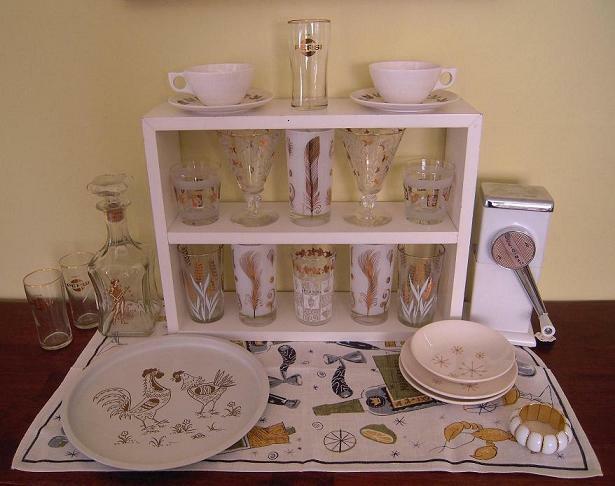 The mid century tea towel, ice crusher, and the trio of Pepsi glasses which show you the proper serving size, much different that today's giant glugs of pop. 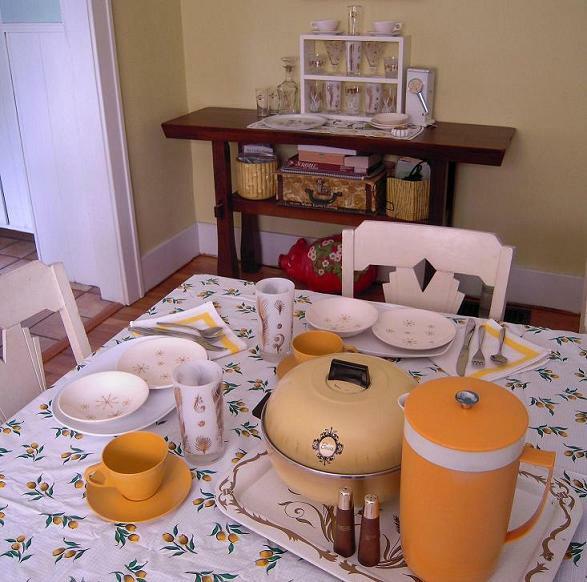 Anchored by a vintage plastic picnic cloth this setting has the usual melmac, some mod mustardy gold star dishes, the classic tray, and a great vintage bun warmer! Okay friends, I don’t know about you but cabin fever is setting in! I need green things and time outside in the not so frigid cold and snow or rain, wait a second, it’s snowing again, UGH! Time to think fresh linens, birds, nests and baking pies for bbq’s! I’m giving you a jump on the situation with a storewide sale! 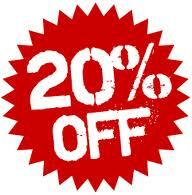 20% off starting now through March 14th! Just use the Coupon Code CABINFEVER2011 during checkout! Happy Shopping! For goodness sake, it’s time to bake! I guess I’ve been on a mini baking spree this past week. It’s still so cold, and honestly I’m just plain tired of it. If I can’t bake myself in the sun this year I’m just going to bake in the oven! Consequently it heats up the house a bit which is a super bonus and it sure makes for a nice rewarding break in the middle of a workday! I’ve been trying out some gluten-free flour and I have to say it’s working out pretty darn good. I wasn't sure what to expect with my impromptu recipe. I like to "refer" to recipes when I bake or cook and then just make my own up. But would it work with gluten free flour? The answer, an astounding yes! 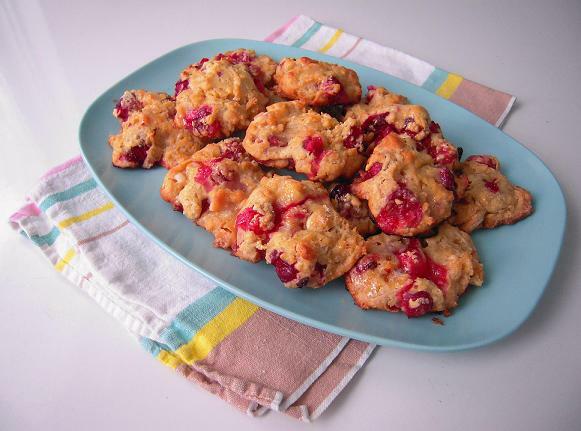 I have to say these cranberry orange vanilla chip drop scones were addictive! I had to excercise some serious restraint so I would have a couple left to bring to my friends' house! Yummy! 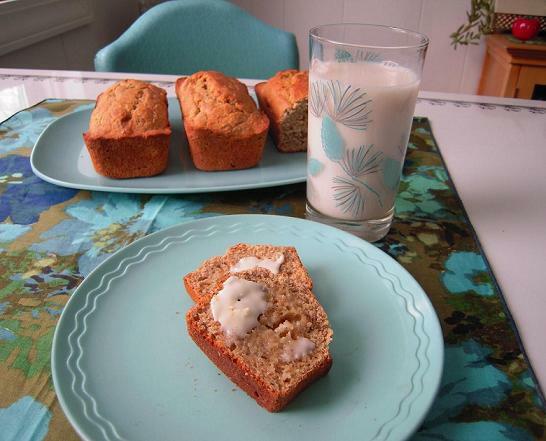 Today's menu: gluten free banana almond bread. Delish with a nice glass of almond milk! Plus I can put one or 2 away in the freezer! And look at that scallopy edged melmac plate, I only have one but I sure love it! Super cute! Oh and the vintage aqua and gray pinecone glass- amazing!